7 highly detailed unique computer generated Walltastic Murals to choose from, ranging from Hello Kitty to Jungle themed murals. Each theme are of the highest quality and make a stunning, eye catching feature to any room with 12 easy steps. Wallpaper has never looked so good. Great for children’s bedrooms, nurseries and playrooms. 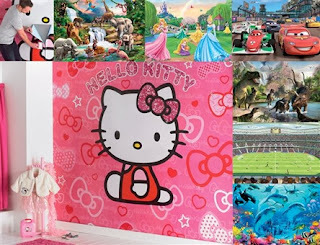 Walltastic Murals arrive in 12 panels and is applied like wallpaper and can be trimmed to fit. Check out this handy YouTube Video of just how easy it can be!